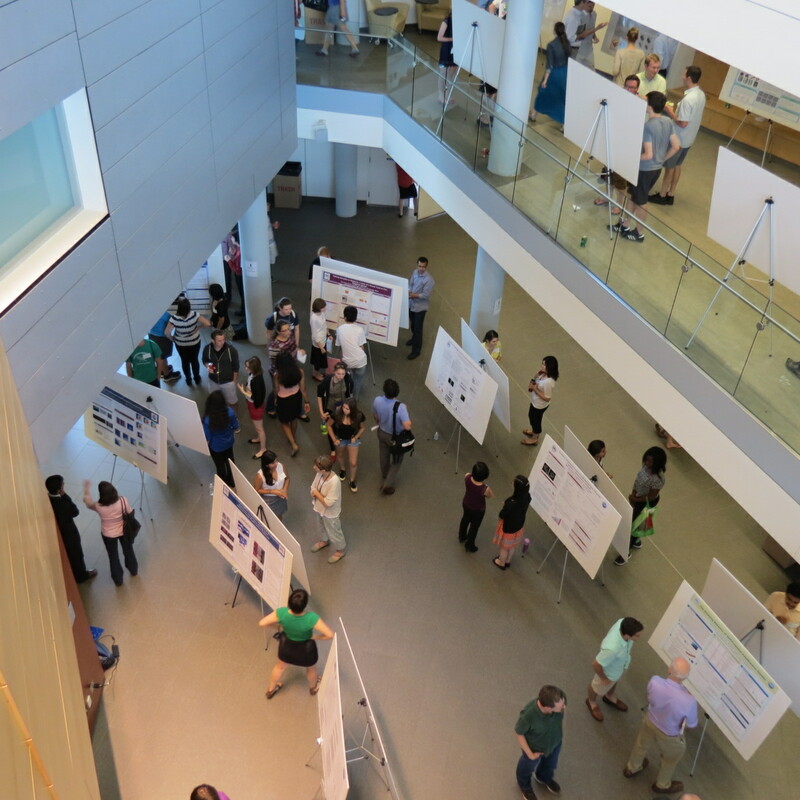 The Brandeis University Division of Science held its annual undergraduate research poster session SciFest V on July 30, 2015. Despite the 90 degree heat (and the steam leak) outside, the student presenters in the Shapiro Science atrium admirably kept their cool and showed off the results of their summer’s (or last year’s) worth of independent research. We had a great audience of grad students, postdocs, faculty, proud parents, members of the Brandeis senior administration, visiting neuroscientists at Brandeis helping evaluate our Computational Neuroscience training program, and physicists at Brandeis attending the IGERT Summer Institute. If you’re a student who didn’t get to present, or you’re a community member who just wanted a chance to talk about science with our energized undergrads, we’re planning another session for Fall Fest 2015. Stay tuned for details. For a few more impressions of the event, see the story at Brandeis NOW. More pictures and abstract books are available at the SciFest site. Division of Science Summer Undergraduate Research Fellowship (SURF), supported by Brandeis alumni and friends, and by the M. R. Bauer Foundation. MRSEC SURF, supported by the Brandeis Materials Research and Engineering Center. Konrad Hochedlinger (MGH) will present work on mechanisms underlying pluripotency in embryonic stem cells and nuclear reprogramming. The talks will take place in the Shapiro Campus Center Theater, and we also invite you to join us at the subsequent Poster Session and Reception. Current and former trainees supported by the Genetics Training Grant will be presenting posters from 3:40 to 5:00 PM on the 2nd floor of the Shapiro Science Center. In addition, all life sciences graduate students are encouraged to present posters. The entire event is free and open to the public. For planning purposes, we ask anyone attending the symposium and/or presenting a poster to pre-register at http://www.bio.brandeis.edu/gtg_symposium/ by September 10th, 2012. You can also visit this website to see the symposium schedule, and to see the list of poster titles after registration is complete. Please join us for this exciting symposium showcasing genetics at Brandeis! 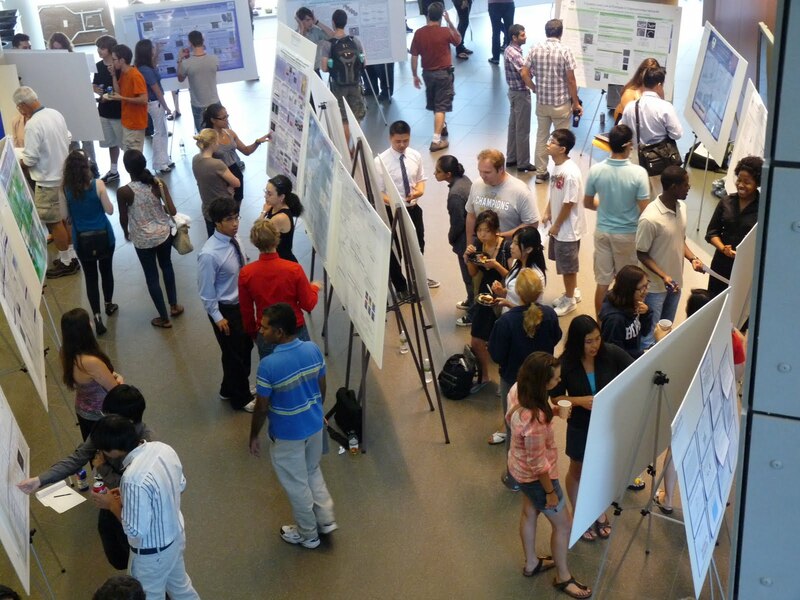 Brandeis Summer Scifest, an Undergraduate Research Poster Session, will be held on Wed, Aug 3 2011. 53 undergraduate students from across the Division of Science, including summer visitors and Brandeis students, will present posters on their work/research. The poster session will run from 1-3 pm in the Shapiro Science Center atrium. The public is cordially invited to attend and to discuss research with the students. Aug 4: The poster session went really well, we had a nice turnout and the students did a great job presenting.